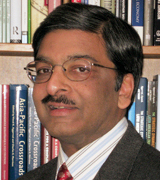 Vinod (Vinnie) Aggarwal is Professor at the University of California at Berkeley, with appointments in the Travers Department of Political Science and the Haas School of Business. He serves as Director of the Berkeley Asia Pacific Economic Cooperation Study Center (BASC), Editor-in-Chief of the journal Business and Politics, and Co-Chair of the U.S. Consortium of APEC Study Centers. From 1991-1994, he chaired the Political Economy of Industrial Societies Program at UC Berkeley. He has held fellowships from the Brookings Institution, Rockefeller Foundation, Council on Foreign Relations, East-West Center, Woodrow Wilson International Center for Scholars, and was a Japan Foundation Abe Fellow in 2008-2009. He has also been a Visiting Professor at the Graduate Institute of International Studies in Geneva, the University of Geneva’s IOMBA program, INSEAD, Yonsei University, NTU Singapore, and Bocconi University. He is also an elected lifetime member of the Council on Foreign Relations and founding member of the U.S. Asia Pacific Council. His authored books include Liberal Protectionism, International Debt Threat, Debt Games, Le Renseignement Stratégique d’Entreprise, Une Nouvelle Approche des Phénomènes Sociaux, and he has edited or co-edited Institutional Designs for a Complex World, Asia-Pacific Crossroads, Winning in Asia: European Style, Winning in Asia: Japanese Style, Winning in Asia: U.S. Style, Sovereign Debt Management, European Union Trade Strategies, The Strategic Dynamics of Latin American Trade, Bilateral Trade Agreements in the Asia Pacific, Asia’s New Institutional Architecture, and Northeast Asia: Ripe for Integration?, Trade Policy in the Asia-Pacific, and Responding to a Resurgent Russia. His latest book is Linking Trade and Security: Evolving Institutions and Strategies in Asia, Europe, and the United States. He has also published over 100 articles and book chapters on the politics of trade and finance. His current research examines comparative regionalism in Europe, North America, and Asia with a focus on implications for the international system and multinational corporations. Dr. Aggarwal received his B.A. from the University of Michigan and his M.A. and Ph.D. from Stanford University. Born in Seattle, Washington, he speaks five languages.